Should you find yourself in London’s Charing Cross Road, on the right-hand side looking south, halfway between the Palace Theatre and Foyles book store, you will find a bar. It bears the extraordinary name of The Montagu Pyke. It is part of the Wetherspoons chain, and is apparently a popular and fashionable spot. A sign outside bears the picture of an assured Edwardian gentleman in an immaculate suit, sporting a monocle, cigar in hand. He is Montagu Pyke, and for a time he was most renowned person in British film. For Monty Pyke was the cinema king. A huge onrush of cinema building occured in London following the passing of the Cinematograph Act (the first UK legislation devoted to the new industry) at the end of 1909. Fortunes were to be made in this new business so attractive to a mass audience which, though it didn’t pay much for its pleasures, was prepared to turn up once or twice a week, every week, to the cinema. For a new breed of speculators, it looked like a licence to print money. 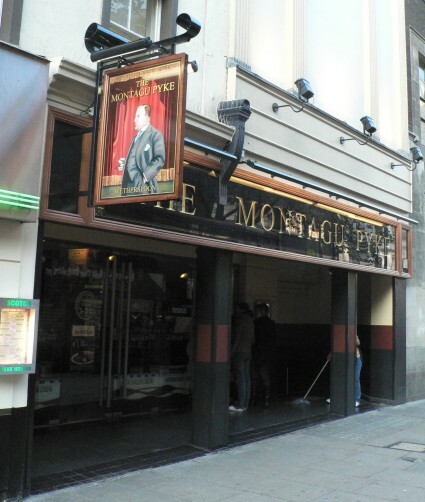 That’s certainly how it must have appeared to Montagu A. Pyke, a former commercial traveller, gold miner and bankrupted stock market gambler. Pyke had seen crowds lined up in Oxford Street to see Hale’s Tours (films of journeys shown inside a rocking rail carriage) and decided this was the business for him. … firstly because it is a very thickly populated neighbourhood, and secondly, it appeared to me from the class of people one sees daily on the streets that they would make an appreciative audience if you gave them good value and the prices were right. Pyke found two shop properties at 164-166 Edgware Road, and recalled that they were next door to Funland, a shop show which operated for a short period in 1908/09 and undoubtedly played its part in influencing the choice of location, as a proven film-going attraction. He raised money by exploiting society connections and spinning tales of vertiginous profits, including £1,000 from Lady Battersea, sister of Lord Rothschild. Pyke placed his first cinema in a populous neighbourhood with good passing trade, and offered a continuous show between twelve noon and midnight, with prices at 3d, 6d and a shilling. Programmes lasted between an hour and an hour and fifteen minutes. Takings, he recalled, were £400 a week, against outgoings of just £80, and Pyke embarked on a rapid programme of expansion, with investors queuing up to join him. Initially Pyke’s cinemas were shop conversions, but his policy soon turned to larger venues in prestige locations. Each building was given the generic title of Cinematograph Theatre. Each cinema was also a limited company in itself (a common feature of cinema capitalisation at this time), but he established an umbrella company Amalgamated Cinematograph Theatres Ltd in 1910, with £150,000 capital, by which point he was managing five cinemas. At its peak, the ‘Pyke Circuit’ included fourteen cinemas in central London. Pyke’s business methods were highly dubious, and soon exposed. A committee of investigation formed in 1912 uncovered numerous business irregularities, including dividends being paid out that had not been earned. Pyke was the most notorious exploiter of investors’ eagerness to profit from the cinema craze. His strategy was based on the assumption that the boom would be short-lived, tempting avaricious investors with quick-term profits from a pyramid of flotations. He certainly profited handsomely himself. From a salary of £25 a week in 1908 he had risen in 1911 to paying himself £10,000 a year. As the cinema business only established itself all the more, and competition from larger and more competently managed rivals grew, Pyke’s business necessarily collapsed. He had only two cinemas in operation by the end of 1913 (Piccadilly Circus and Cambridge Circus), and was made bankrupt in 1915, the same year in which he was accused of manslaughter following the death of an employee in a nitrate film fire at the Cambridge Circus venue. Pyke’s ambitions to expand into the provinces were never realised. Amalgamated itself was reconstituted as a company in December 1916 and continued to manage five theatres (Edgware Road, Finsbury Park, Oxford Street, Walham Green and Shepherd’s Bush) to the end of the war. Pyke had been the most prominent figure in the British film business for a short while, but he disappeared into obscurity. Few cinema histories mention him, and it was only with the growth of interest in a social history of British cinema that researchers started to recover his story. Their task was helped by the publication of a chapter of Pyke’s otherwise unpublished autobiography, When I Was the Cinema King, in an edition of Picture House, the Cinema Theatre Association journal (no. 10, 1987). The text was made available by his grandson, Christopher Pyke, who has now produced a website devoted to Pyke and to selling a book, a self-published combination of biography of Pyke, using his memoir, and an account of Pyke’s own investigation into his grandfather’s history. 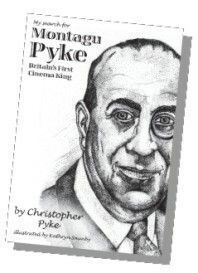 The book, My Search for Montagu Pyke: Britain’s First Cinema King, can only be ordered online from CPI Book Delivery. It was launched last month at the Montagu Pyke bar. Not least of the charms of the Picture Theatre for me is the fact that it is, in the real sense of the word, catholic, appealing not only to men and women of every class and degree, but to men, women and children of all ages. Before its advent, the process of amusing or interesting the child at a public entertainment was a somewhat difficult one, while the possibility of instructing him or her thereat, was never considered at all … The Picture Theatre, if it has done nothing else, has brought delight to the minds and souls of thousands upon thousands of mites in this great Metropolis, some of whom look upon it as the one oasis in the desert of their dull and sordid lives. The signboard outside the former Cambridge Circus Cinematograph Theatre (where the fire took place) depicts Pyke in his pomp, adapted from the 1911 Vanity Fair portrait of him at the top of this post. He would be proud. This post is adapted from my 2006 paper on London’s first cinema circuits, Unequal Pleasures: Electric Theatres (1908) Ltd. and the early film exhibition business in London, which you can find on my personal website.